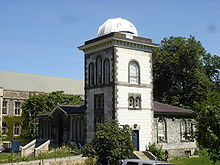 In 1840, the British government built the first Royal Magnetic and Meteorological Observatory on the west side of King’s College Circle (near the site of Convocation Hall), on land set aside by the University for the use of The Crown. 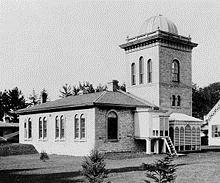 One of only four observatories built worldwide to research the earth’s magnetic field, the Canadian government took over responsibility for the facility in 1855 and replaced the existing log structure with a stone building. By the 1890s it was clear that the location of the original building was no longer a desirable site for an observatory. The introduction of the streetcars on College Street, in 1892, and the iron used in the construction of new campus buildings interfered with the magnetic equipment. The effectiveness of the telescope was also compromised by the nearby construction of Convocation Hall and the Stanford Fleming Building. In 1898 the magnetic equipment was moved to a new magnetic observatory in Agincourt, and the Meteorological Service began planning for relocation. The University agreed to grant a new parcel of land on campus for the building of a new meteorological headquarters, in exchange for the old observatory. In 1907, the old observatory was disassembled and moved to its current location on Hart House Circle, and the southwest corner of Bloor and Devonshire became the site of the new headquarters for the Dominion Meteorological Service in 1909. Fig. 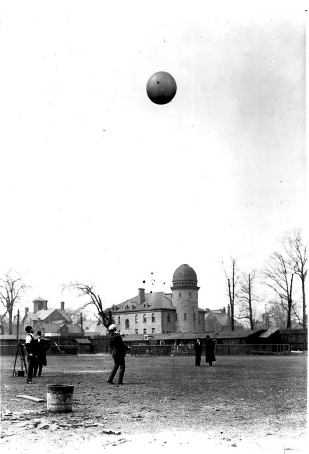 2 View of the Dominion Observatory from the site of Varsity Stadium, c. 1909. (Source: City of Toronto Archives). Located on the corner of Bloor Street West and Devonshire Place, the property is directly associated with the history and growth of the Dominion Meteorological Services and its early association with the University of Toronto. It contributes to the institutional character of Bloor Street West and defines the northern edge of the University’s downtown campus. The design and value of the property is found in its association with the firm of Burke and Horwood. It is an excellent example of the institutional projects completed by the firm in the late 19th and early 20th century. The architecture of the building is notable for combining the features of Romanesque Revival with the requirements of an observatory program. The formal expression of the tower and skylight opening in the transit house both refer to the property’s history as a scientific research building. Adapted from David Ewart’s plans for the 1899 Dominion Observatory in Ottawa, the building also contains specific architectural details that reference this predecessor. The original circular tower was built to house a 6 inch Clark telescope (which was eventually donated to the David Dunlap Observatory in Richmond Hill after time observations were stopped around 1930.) The dome and the heavy masonry core that stabilized the telescope were removed as part of renovations in 1934. 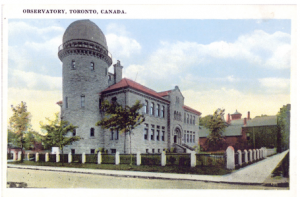 The dome can still been seen to this day as it was relocated to the top of the Louis Beaufort Stewart Observatory in front of Hart House on the St. George campus at the University of Toronto. The transit house to the west of 315 Bloor St. held a meridian telescope which was also essential for timing the passage of reference stars. The house was constructed at a slight angle to the main building so that the roof opening on the right of the house is exactly north-south. After 1936 its space was converted for use as offices. Prior to housing the Munk School the building has been occupied exclusively by these two institutions; the Dominion Meteorological Service from 1909 to 1971, and the University’s Admissions and Awards Office from 1975 to 2010. The occupancy of the site by the Dominion Meteorological Service is particularly significant because of the Service’s contributions to the study and practical application of meteorology. One such notable figure is John Patterson, credited with modernizing the Service and establishing a more scientific basis for weather forecasting. As the Service’s Director from 1929 to 1946, Patterson contributed to the creation of the University’s first postgraduate degree in physics for meteorology. He helped channel the Service’s research and the University’s curriculum towards the advancement of aviation meteorology, which had considerable benefits for the war effort. The Patterson Medal was created in his honor in 1954. 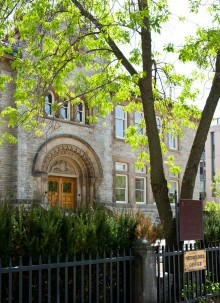 After 1975, the building became a gateway for new students being admitted to the University of Toronto, and housed Admissions and Awards until the expansion of the Munk School in 2010. Royal Magnetic and Meteorological Observatory is rebuilt replacing the log structure with stone. Royal Magnetic and Meteorological Observatory is disassembled and moved to its current location on Hart House Circle. The Munk School of Global Affairs and Public Policy expands its campus to 315 Bloor Street West. The building is fully restored, renovated, and opened in January of 2012.